Changing course after 20 years, university tells European Americans it won’t rent them space to celebrate their Heritage. Is this the change we can expect to happen more often because of a Barack Hussein Obama presidency? This is another wake-up call for European Americans to stand-up and fight for their freedom and heritage just like every other ethnic group does. Join with the SCV and lets stand together united, in defending our God-Given rights. A march each January near the Johns Hopkins University campus honors Confederate Gens. Robert E. Lee and Stonewall Jackson. 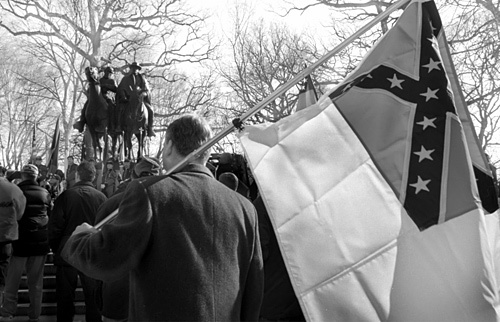 Every January, descendants of Confederate soldiers gather in Wyman Park to march under the banner of the Confederacy, sing “Dixie” and lay wreaths at the monument to Robert E. Lee and Stonewall Jackson, legendary generals of the Confederate States of America. And afterward, for 20 years now, everyone has gone across the street to the Johns Hopkins University for coffee and refreshments, with some of the 200 descendants and observers still wearing the uniforms of Confederate re-enactors and carrying the flag. But next year will be different. Hopkins has informed the Maryland divisions of the United Daughters of the Confederacy and the Sons of Confederate Veterans that it will not rent space to them. The Jan. 17 event is scheduled for only a few days before the inauguration of the nation’s first African-American president. The university received complaints after the march last January and says that it no longer wants to see the Confederate flag flying on campus. Members of the Confederate groups say they are victims of political correctness run amok. The ceremony will go on. The groups get city permits to gather in the public park next to the Baltimore Museum of Art, where the monument of Jackson and Lee astride horses was dedicated in 1948. “You have a situation where we’ve let other people define us, and in the past haven’t spoken out as strongly as we should about other groups who have usurped the use of our flag,” said Michael K. Williams, commander of the Gilmor Camp of the Sons of Confederate Veterans. He acknowledged that Hopkins is a private institution, but he said that because it receives federal money it must adhere to federal nondiscriminatory policies when it comes to renting space on campus. Williams said his group is a federally registered 501(c)(3) nonprofit organization.